Summer time in Texas. It's hot. Hit the rivers, bask in the sun, and cool down. Floating the river is the place to be. As part of the "Bucket List" article in March 2010 and the "13 Escapes" article in the June 2009 issue of Texas Monthly, we were recommended as the source for tubing information in Texas! Thanks! Tubing (or "toobing", or "floating") is floating down a slow moving river in an oversized inner tube. 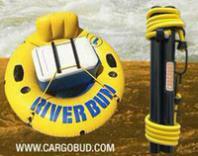 Most people get a cooler for cold drinks, put it in another inner tube, and tie it to one of the tubers. Then the whole party latches on to the cooler tube flotilla-style and sits back for a relaxing time. Who can say it isn't simple? Texas summers are like an oven. Our spring-fed rivers are icy cold. Some mad genius grabbed an inner tube and jumped in! What's New At Tube Texas? We're working to give you top notch river and rafting information, so be sure to drop us a line with your thoughts if you've got a moment. We love water sports — floating the Texas rivers is no exception — and want to share that others. We give you up to date information about tubing trips and river conditions. We are not outfitters; we do not sell or rent inner tubes. We do not take reservations for tubing trips. We're interested in hearing from tubers and from outfitters. Contact us! Also, if you ask us, it's tubing, not toobing. However, in Texas tubing companies often use "toobing". Water sports are a great way to relax on Texas rivers. But be courteous of land owners and the real estate around the water. Take your cans with you. Kayak, canoe, rafting, fishing boat, or tube ... help keep it clean.